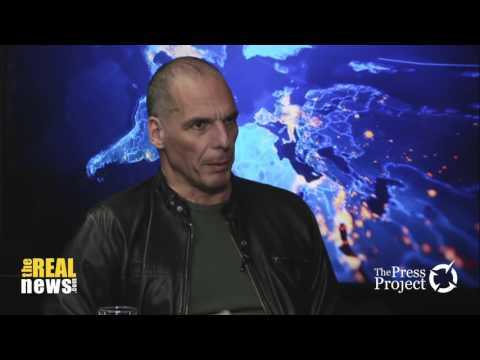 Former Finance Minister of Greece Yanis Varoufakis speaks with thePressProject, TRNN's Greek collaborator, about Syriza, Greek austerity, and his future political plans. Since the beginning of the crisis, the face of Europe has changed. New problems, challenges and unprecedented economic hardship has altered not only the way that Europe operates but the notion of Europe for its very inhabitants. The economic crisis which hit Europe after, but not because of, the collapse of Lehman brothers, has yet to end. As a result, many nations of the eurozone have seen their public debt coming under heavy scrutiny and their market credibility plunging. The Eurozone chose to impose policies of austerity and fiscal discipline in an attempt to save the integrity of the Euro not only as a common currency but as a whole. Unemployment, particularly youth unemployment has risen and spread while several countries, Greece holding the sad record, were forced to enter programs of austerity which changed the living standards of millions of European citizens. These problems have caused a shock mainly in the way the Europeans understand Europe to be and the realization of the way this group of countries works, both in terms of its economic political structure as well as the institutions of the EU and the Eurozone. For the first time in the history of the EU, large numbers of citizens realize that the previous narrative of a Europe of the people, consisting of countries which will constantly strive to achieve the European Dream of completion and unification to the maximum possible level without jeopardizing their unique characteristics is far from close. Instead the EU and the Eurozone have recently proven to be mechanisms where competition and finger pointing thrive. The vision of solidarity and good will has given its place to a group of countries where the strongest do not hesitate to oppress the weakest. In the more recent years migration towards Europe has also soared. Hundreds of thousands of desperate people are fleeing their countries due to the wars in the muslim countries or due to extreme poverty which is proving just as frightening for those who have to face it. A deeper analysis might find that these problems are not separate from the economic crisis but we need to underline for now is that the countries of the EU have not shown homogenous reaction towards that. Some, like the prominent Germany have decided to welcome a large number through their borders while others, mainly countries from the former eastern block have shown extreme xenophobic reactions by completely closing their borders. Those countries whose borders are also the outer borders of Europe, these days mainly Greece and Italy face a completely different set of challenges as they have to acommodate thousands of migrants who enter the countries by any possible means. As a result, disappointment and suspiciousness soar among European citizens followed by the rise of movements and parties which are highly skeptical if not downright anti-european. All these developments might lead to the conclusion that the, so called, European Vision is coming to an end, but this should not necessarily by the final result. New European movements and parties could emerge, integrating these valuable lessons in order to propose new paths to the Europeans. The world is a very different place from what it was in the beginning of the EU so new theories, ideas, and practices will have to be introduced if the European dream is to secure its future. We are joined today by Yanis Varoufakis who’s an economist and former Minister of Finance for Greece. Hello and thank you for joining us. CHRISTOS NTATSIOS: We’ve all heard that on the 9th of February you’re planning to announce the creation of your movement your democracy for europe movement in Berlin. So my first question is exactly that, why is it a movement and not a party. YANIS VAROUFAKIS: Well to begin with, the point is to begin the conversation that Europe has been denying itself for 5-6 years ever since the euro crisis begun. A crisis that has been causing Europe to fragment in a variety of ways, so the point of this movement is to bring people together independently of political party affiliation and therefore not in opposition to existing parties, around the table in various fora around Europe, to begin this conversation that would lead, hopefully, to a consensus about how we can commonly address our common problems. Once this consensus emerges then this consensus will be busting out to have its own representation electorally in different countries and then we shall see how…what form that representation would they… would take. So this is a completely dynamic citizen based cross border European movement highly political, it’s not a think tank or anything like that. A surge of Europeans who are particularly concerned about the state of Europe the lack of democracy the death of democracy and the fragmentation process. CHRISTOS NTATSIOS: My second question is funnily enough again about the name. The name democracy in Europe suggests that there is a lack of democracy. Now the the average European might disagree with the general policies that are being implied but I don’t think that the average European feels that there is an actual lack of democracy as such. Is this the case? YANIS VAROUFAKIS: Until about a year ago that was probably right. The way in which the democratically elected government of Greece was crushed by an ironclad unelected troika of creditors however, alerted many Europeans, even those who disagreed with our government, to the not “democratic deficit” by the deep contempt for democratic process in Europe. When I went to for the first year the group I was told in no uncertain terms by high and mighty finance ministers that elections cannot be allowed to change anything. When we put in June late June to the Greek people we called for a referendum to ask the Greek people to decide on an ultimatum given to us by the European Union again this contempt for the democratic process for the right of citizens to have a say in these important matters was manifest everywhere. There is no democratic deficit in Europe there is a complete lack of democracy. Finance ministers, Prime Ministers, Presidents are elected democratically but decisions in Europe that matter are being taken at a European level in unelected unrepresentative unaccountable unlawful fora I like the Eurogroup. Did you know that the Eurogroup is not a legally constituted forum and it makes all the decisions that affect every European. This complete lack of democracy is utterly intertwined with the failed policies that Europe’s insisting upon which, because of the-they were almost designed to fail, cause the fragmentation of Europe and the only way to prevent this fragmentation that Brussels and Frankfurt know, is increased authoritarianism even less democracy so this a spiral that is running out of control. CHRISTOS NTATSIOS: You’ve been behind those “closed doors” where the decisions are being made. Is the average- the European to expect that beyond the differences the political differences or the differences in policies there is some minimum of rationality of technocratic knowledge which assures us that right decisions will be taken? YANIS VAROUFAKIS: Exactly the opposite, just look at the comedy of errors of the last five six years. Every single policy, everything single institutional intervention the creation of the European Financial Facilities Mechanism, the creation of the European so-called Stability Mechanism, the way in which the European Central Bank is running quantitative easing -which are very different to how the Fed did in the United States, to how the Bank of Japan was doing it. These are all very clear signs that the beaurocracy which presents itself as a competent technocracy is anything but. There is incompetence that leads to failure, which leads to authoritarianism which leads to further incompetence. And this is why Europe is fragmenting. YANIS VAROUFAKIS:Its not that they didn’t like my style, they didn’t like that I wasn’t prepared to sign up to a failed program. That’s what they problem was, I can assure you if I was prepared to say yes like previous Finance Ministers were, I would have been celebrated as an excellent colleague. CHRISTOS NTATSIOS: Right ok. And my last question is…this movement in today’s Europe…any formation, or movement or a party whatever they have to have some pronciples regardirng the big European issues. CHRISTOS NTATSIOS: And this would be for now, the migration problem? YANIS VAROUFAKIS: Not just that, we have a manifesto that will be made public very soon, which covers all the basic principles that unite us. If you want the manifesto is the gateway to DM, to the Democracy in Europe movement…everyone who accepts those principles…but if you want me to give you a sneak preview: we have very clear policy on transparency, we believe for instance that Eurogroup meetings, council meetings, all meetings should be live-streamed, that their minutes should be published, that every decision that is made of behalf of the Europeans should be taken under the scrutiny and the gaze of European citizens. We believe in open borders, we believe that the “beggar thy neighbor” attitude of trying to push refugees onto some other jurisdiction…of trying to avoid doing our bit for resolving the Euro crisis, of constantly trying to freeload on other Europeans, this must end. On the question, the larger question of migration, not just the refugees, we have the view that Europeans must accept the historical dynamics of the last thousand years. For centuries Europe has been populating the earth, we have been exporting Europeans to the Americas, Australia, Africa, Asia, we have been colonizing, killing off tribes and creating the world in Europe’s image. Now the democratics, the demographics are changing and we have to accept that the rest of the world is now repopulating Europe. Until and unless we understand that our borders cannot be as fences and that fences breed insecurity in the name of security, we are not going to doing our duty as global citizens. YANIS VAROUFAKIS: Well Aristotle defined democracy as the constitution in which the poor and the free are in the majority. So this is a clearly progressive, left wing concept and this is why it has always been either despised by the powers that be, the concept of democracy or they tried to co-opt it to usurp it to accept its image but deny its substance. CHRISTOS NTATSIOS: Yani I thank you very much. Ladies and gentlemen this was Christos Ntatsios for the PressPorject via the Real News Network. Goodnight.